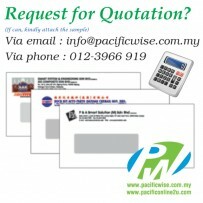 Please call up for quotation. Tel:012-3966 919. CUSTOMIZED PRINTING White Envelope Window 9.5"x4.5"2color@10bxs! 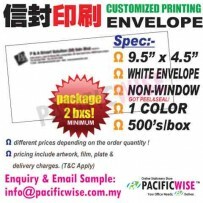 CUSTOMIZED PRINTING White Envelope Window 9.5"x4.5"3color@2bxs! CUSTOMIZED PRINTING White Envelope Window 9.5"x4.5"3color@6bxs! 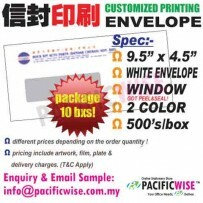 CUSTOMIZED PRINTING White Envelope Window 9.5"x4.5"3color@10bxs! CUSTOMIZED PRINTING White ENV Non-Window 9.5"x4.5"1color@2bxs! CUSTOMIZED PRINTING White ENV Non-Window 9.5"x4.5"1color@6bxs! CUSTOMIZED PRINTING White ENV Non-Window 9.5"x4.5"1color@10bxs! CUSTOMIZED PRINTING White ENV Non-Window 9.5"x4.5"2color@2bxs!